How to divide your rhubarb crowns -- in pictures and simple instructions. 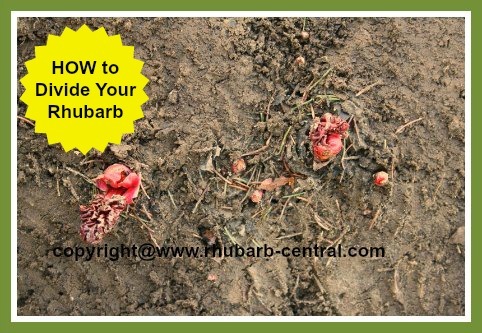 Whether you want to thin your rhubarb patch, divide old rhubarb crowns, enlarge your rhubarb patch by transplanting, or share your plants with a friend or neighbour, dividing rhubarb is easy to do! When is the best time to divide rhubarb crowns? Rhubarb can be divided in either the Spring or the Fall. Myself, I prefer to do this in the Spring. In early spring, just when plants begin to come out of dormancy is the ideal time to divide them. 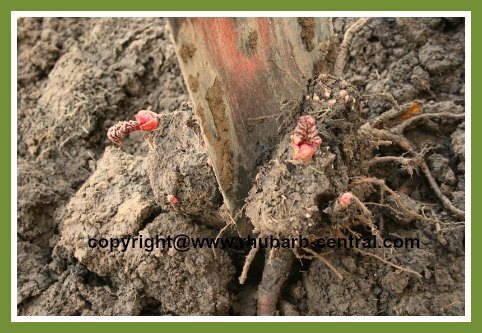 At this time early growth is just beginning on the rhubarb plants, so you can easily see where best to divide the root mass, also known as the rhizomes. Some gardeners prefer the autumn for transplanting because the plants are dormant. 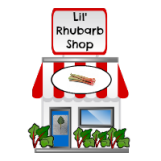 Either time of year that you choose, the actual division method for rhubarb is the same. 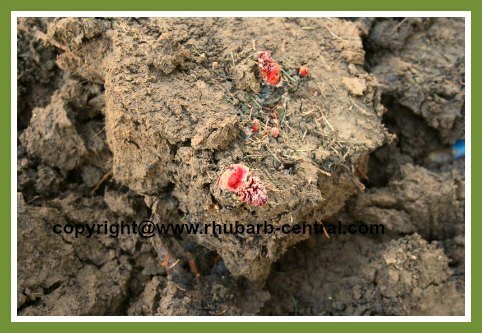 How old do rhubarb plants need to be before dividing them? 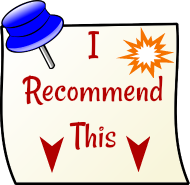 Divide crowns that are 4 - 5 years old; sometimes younger plants can be successfully divided as well. Do not divide crowns that are diseased. 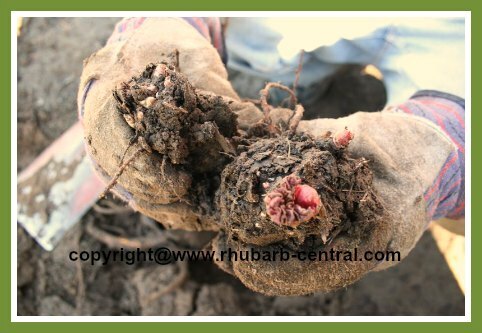 When the rhubarb is starting to "peek" up from the soil is a good time for Spring-time dividing of the rhubarb crowns and roots /rhizomes. My rhubarb patch is near a pine tree ;) so that's the reason for all the pine needles in the images! Gently trying not to damage the crown, using a garden fork, loosen to lift the rhubarb crown and rhizomes. 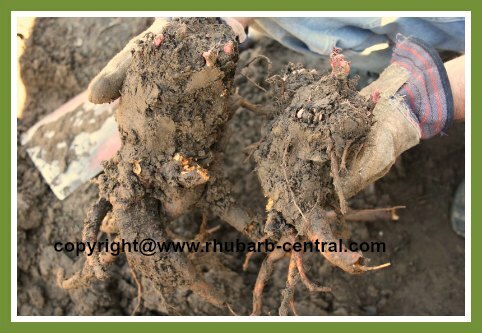 The size of the rhizome /root mass depends on the age of the rhubarb plant. 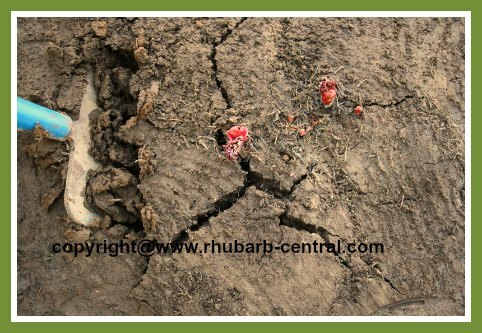 Some very old rhubarb plants can have root masses that are up to three feet in diameter and one foot deep. Lift the rhubarb crown and roots (with the clump of dirt encasing it). You will no doubt break some of the roots, but that is unavoidable ... no worries! Do try and be careful not to break off the delicate (reddish) buds. 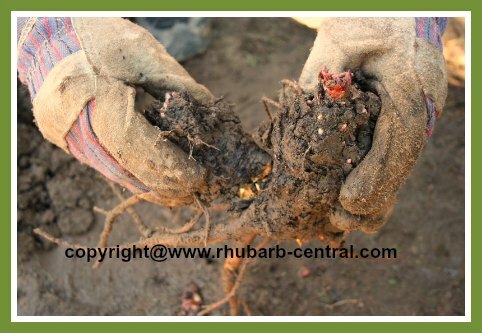 Using a (sharp) spade cut through the root (rhizome) cluster between "buds" or "eyes" (reddish) of new growth. (Cut roughly into two parts). Using your hands, gently break apart the crown and roots between buds or eyes. The roots are quite hardy, and will tolerate quite a bit of rough handling. You can repeat this step several times if the crown is large. In fairly large crowns you can cut the roots into 4 to 8 pieces. 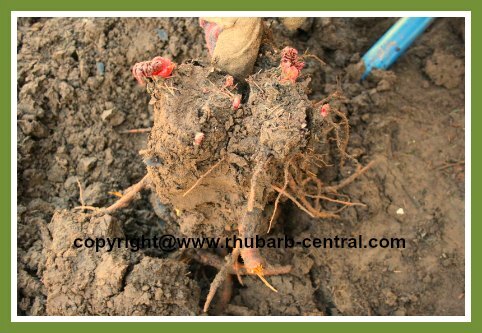 Each new rhubarb plant will have a small rhizome, some roots and a "bud" of new growth (if dividing in the Spring). The "clumps" or divisions that you will transplant should have at least about 3 inches or about 8 cm. of a combination of roots/rhizome/bud. (I chose not make too many divisions as I wanted to plant larger plants). All of these "clumps" will grow into mature, healthy plants if properly re-planted. You are ready to re-plant the rhubarb roots! Before planting, examine the rhizomes /roots for any excessive rot or decay (remember that it is normal for some decay to be present as this is normal during plant growth), and cut that part off, or, if in very poor condition, discard that clump. 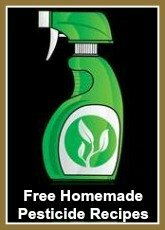 Most often you will find that you do not need to remove any of the clump. 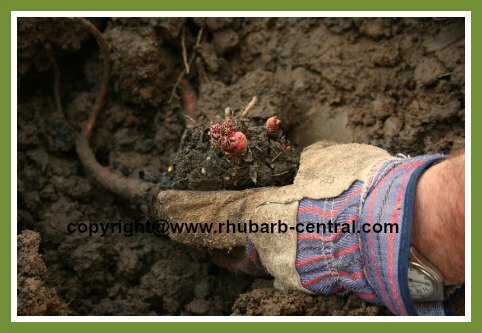 Dig a hole where you wish to transplant the rhubarb too, add the rhubarb root clump; the top of the crown should be about 1 1/2 - 2 inches below the soil surface. Fill in the soil and firmly press the soil around the new planting and water well. DONE! ... Wasn't that simple? 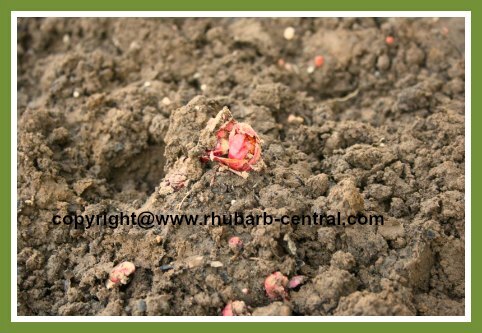 Note - if you are not planning on re-planting the rhubarb roots immediately, you must ensure they are protected from freezing temperatures and kept from drying out.